The fathers in our farm community hated Halloween. That’s when local teenagers would sneak out at night and topple neighborhood outhouses. They thought it funny. But those pranks meant we and our families had to wait, sometimes with growing urgency, for our dad’s to set the outhouses upright again. It’s not that the outhouses were damaged, you understand. Most were built so well they were darned near indestructible. However, they were not exactly usable while lying on their backs. No one in our rural area at the time had indoor toilets or septic systems. So, huge importance was given to these vital outdoor plumbing facilities, located strategically a breezy distance downwind from the houses. And thus, much urgency was attached to an early resurrection of same. After all, certain calls of nature demanded prompt attention. And one should not ignore that other hazard of toppled toilets — the open and highly odiferous pit, left unprotected adjacent to the downed outhouse. So how could this Halloween vandalism . . . these vexing pranks . . . be stopped? Winter passed, spring and summer came and went, but no agreed-upon solution had emerged. Then, the harvesting was done and the fall season for social events got underway once more. Halloween was approaching. One day, neighbors gathered for a thorough airing of the issues, so to speak. The meeting followed a year of discussions at community picnics, dances, box socials, weddings, funerals and other pretexts for gatherings, mostly at the local one-room country school. A number of solutions had been advanced. These included guard dogs and shotguns with shells filled with rock salt. Mercifully, none of these more aggressive notions garnered much support beyond wishful thinking. Henry sat quietly through the criticism and heckling. Quiet descended. The doubters began to listen. Maybe this guy wasn’t full of it after all. Henry’s brilliant idea was a hit. The neighborhood buzzed with excitement as Halloween approached. Apprehension and annoyance had been transformed into anticipation. 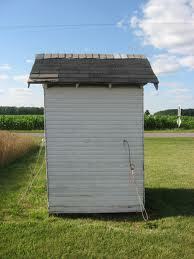 Neighbors teamed up to help move each other’s outhouse surreptitiously after dark on the fateful night. The culprits were almost certainly teenaged boys from the neighborhood. They would belong to the very families supposedly conspiring against them. The boys couldn’t help but be tipped off about the traps being set for them. Ah, but the boys had also overlooked something, too. They’d underestimated Henry. He didn’t tell them about Part Two of his plan. Henry had guessed who were the most likely suspects, and had assumed correctly they would learn about the traps being planned for them. He began quietly putting into effect Part Two. To do so, Henry went down the road to see Pete, his neighbor half a mile away. Neither had teenaged boys. Pete agreed to Henry’s secret Part Two . . . and agreed to keep it just between them. The plan was to outsmart the Halloween pranksters by moving their outhouses in the opposite direction to the public plan, that is, forward, not backward. This would leave the pits wide open and behind the outhouses, the location the teenage pranksters thought would be safe to use to go about executing their nefarious deeds. After dark on Halloween night, Henry and Pete helped each move their outhouses forward. Earlier, they’d cut tree branches and bushes. They used them to camouflage the open and unprotected pits. Then, dressed in dark clothes, each sat in the shadows beside their respective back porches waiting to observe as the anticipated events unfolded. The next morning, Henry and Pete exchanged stories over coffee, unable to suppress their hilarity. Between outbursts of laughter they described for each other, which neighbor’s boy had gone how deep into the obnoxious substances at the bottom of those outhouse pits . . . along with the surprisingly coarse words the boys had used to express their dismay, and how quickly each culprit had run to nearby ponds or dugouts and jumped in fully clothed. From that day forward, nary an outhouse for miles around ever tumbled again, save for those that did so on their own accord . . . from old age, after many years of faithful service, relieving its owners of their burdens. Naturally. Wonderful glimpse into the past and extremely well written!! So very enjoyable. A good laugh as well. Love it. Too funny. 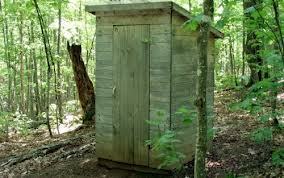 I think it’s always fun to catch a prankster but when it comes to outhouses… hilarious. I’d have hated to be one of those teens that got ‘caught’. What a “stinky” trick! Brilliant! This entry was posted on October 17, 2013 by James Osborne in Collected Short Stories and tagged Halloween, outhouses, Plan Two, plans, rural, teenage pranks, toilets, vandalism.